Alice Victoria Gifco, a long-time Moose Javian, well-known for her open-heartedness, avid curiosity, and quick wit, passed away peacefully on Monday, February 4th, 2019, in Craik, SK. She was 100 years old. Alice Hale was born on November 14th, 1918 in Sceptre, Saskatchewan to Robert and Maud (Cunningham) Hale, three days after the end of WWI. She was given her middle name, Victoria, as her mother held her for the first time and watched bonfires light up the prairie sky, in celebration of the news that had arrived by telegraph that day of the Allied victory. After Alice graduated from high school in Sceptre, she was accepted to the prestigious nurse’s training program at Vancouver General Hospital, moving all the way to the west coast in 1939. She graduated from the program in 1942, spent the following summer working as a nurse at the Vancouver Children’s Hospital, and then received her Public Health and Nursing Diploma from the University of British Columbia in 1943. She was back in Saskatchewan, working as a nurse in the hospital in Prelate, SK, when she met the new teacher at a dance in nearby Sceptre, in 1944. Alice and Thomas (Tom) Gifco were married on June 29th, 1945. As the family grew to include three little ones, Tom’s teaching jobs took them all around Saskatchewan, from Saskatoon, to Cutknife, Neilburg, Dinsmore, Eyebrow, and Oxbow, until they ended up in Moose Jaw in 1959. Alice worked as a Public Health nurse for a number of years in Moose Jaw before retiring in 1985. She was also active in the community and was a member of a number of organizations, including St. Andrew’s United Church, the Moose Jaw Canadian Club, and the Order of the Eastern Star. She was a proud lifetime member of the New Democratic Party. Alice loved gardening, was a great cook, and had a seemingly limitless number of other hobbies, including sewing, crocheting, knitting, quilting, needle work, curling, square dancing, and reading. She and Tom traveled as far afield as Japan, Great Britain, Australia, Mexico, and the Panama Canal. More than anything, Alice loved her family. She was an extremely caring sister, wife, mother, grandmother, and great-grandmother. Alice was predeceased by all six of her siblings. She was particularly close to the two closest in age: her older brother Earl, who died fighting as a pilot in WWII; and her younger brother John, and later his wife Eileen, who often accompanied Alice and Tom on their travels. Alice and Tom were married for 67 years when he passed away on August 24th, 2012 at the age of 92 years. 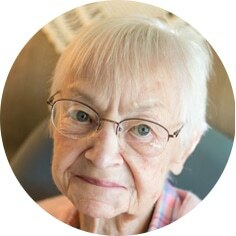 Alice Gifco is survived by her three children: Allan Gifco, Karen (Glenn) Hagel, and Leslie Gifco, all of Moose Jaw, SK; her three grandchildren: Kristin (Lawrence) Ator, Meredith Hagel, and Christian Gifco; her three great-grandchildren: Juliet, Nora, and Dexter Ator, to whom she is affectionately known as GG; her sister-in-law, Eileen Hale; and a number of nieces and nephews. The family is very grateful for the loving care Alice received at the Mulberry Estates and West Park Crossing retirement homes in Moose Jaw. They would particularly like to thank the staff at the Craik and District Health Centre, where she spent the last five months of her life, for their attentive and compassionate care. Alice’s life will be celebrated with a Memorial Service on Friday, February 15th, 2019 at 2:00 p.m. in Moose Jaw Funeral Home. Reverend Jim Tenford will officiate and interment will take place in the Garden of Memories of St. Andrew’s United Church, Moose Jaw, SK at a later date. For those who cannot make the journey in person, a live webcast of the service will be available through the Moose Jaw Funeral Home link on YouTube. Flowers are gratefully declined. Friends so wishing may make donations in Alice’s memory to Citizens All Association, 410 Hochelaga St E, Moose Jaw, SK S6H 0P3 or to a charity of one’s choice. Arrangements are entrusted to Moose Jaw Funeral Home, 268 Mulberry Lane. James Murdock, Funeral Director 306-693-4550. Sincere condolences on the passing of Alice. She has been a constant in my life for so many years. She was such a lovely, strong role model for so many. I will miss her. Thanks for choosing CA as her charity of choice. I will watch the webcast as I am currently in Costa Rica. Love to you all. Farewell to a fine lady. We will miss her. Alice was an amazing woman (I never knew about the ‘Spitfire’ nickname but it made me smile because that is how I always saw her). I am honoured to have shared a small portion of her journey. Love and hugs to all of you. I was so delighted to meet my Great Aunt Alice in Moose Jaw a few years ago. She left an impression on me as a most admirable and interesting woman, and this lovely obituary just confirmed this impression. I did not know that she was a UBC alumna! As I walk on the UBC campus in the coming days, I will think of her having done the same so many years ago as a vibrant, curious young woman. Sending my condolences to the Hagel family and all who knew Alice well. Our deepest sympathy to the family and friends on the passing of Alice. She was an amazing lady who will be dearly missed by all who knew her. Another long time St. Andrew’s Church member is gone. She is re-united with her husband Tom in heaven. What a life well lived. To Gifco family…. I remember Alice and Tom when they lived in Eyebrow. I remember my mom taking me to the Gifco home to get Alice to give me a shot of penicillin. Probably that when on for a week, I don’t remember that part. Now that was a long time ago! I think Alice kept the medicine in her fridge and she had the needles. She was sure a caring lady. Karen, it was nice to meet up with you again at Ina Graften. 100 years old! That is amazing! You all will miss her. I send our special thoughts and condolences. Les, my sincere condolences to you and your family on the passing of your mother. Dear Glen, Karen, Allen and Les, So sorry to hear of Alice’s passing. She sure lead a full, wonderful life. She will be missed. Thinking of all of you at this sad time. Memories will surely help you through.